This month I have chosen Carole Epp's 'musing about mud' as the blog of the month. This blog offers invaluable information to all ceramists on a continual basis. Want to know what is happening at any time in the world of ceramics, or what competitions or exhibitions are coming up, musing about mud is the place to find all this and much more. Thank you so much Carole for this truly incredible service. It is one of the blogs I have to visit every time I am online. 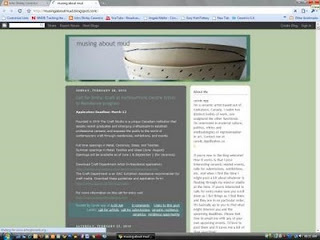 hi john, i love carole's blog and both her sculptural and functional work. i don't know where she finds the time to keep current on all the information that she presents. i also love the artist of the day months where she posts different people everyday. You guys are all so sweet! It's my pleasure and honor to host the blog! It's been an amazing way to "meet" so many amazing artists, thinkers, makers, writers, inspiring people. I'm not sure what I would do without this amazing online community.Thanks to you all!